Last weekend, Dave and I went to Houston for his High School Reunion and I wasn’t into it. I was irritable. I had a really hard time shifting gears from “get things done at home” to “relax have fun somewhere else.” Instead of finding it nice to be away from all the tasks at home, they were nagging at me from afar. Out at the bar on Friday night I was a bit of a wall fly – Not very engaged, not very talkative. I doubt I impressed Dave’s classmates. On Saturday morning, we were awakened by the sound of jackhammers and the scraping of huge metal plates. The roadcrew right outside my mother-in-law’s house got started at 7:00am. Sleeping in wasn’t an option which didn’t help with my irritability. By 10:00am were at the Menil Museum. It’s a lovely art museum, it’s free and it’s several miles from the construction noise. Turns out, the Menil is closed till 11:00 and I had to pee so we walked to the Rothko chapel. I have been coming to this chapel for 10 years or so and I’ve always enjoyed it…. mostly as spectator. I walk around, look at the huge black paintings on the wall, think about the artist, this final project and his suicide. He didn’t live to see the chapel completed. This time, Dave and I had the place to ourselves. After a few minutes and a stroll around the space, I sat on the cushion right in the center of the quiet space, a bold move for someone like me who practices in private, in the dark of the morning. I was under the skylight, bathed in diffused light and surrounded by the huge black paintings. For the first time, I wasn’t a spectator, I was there to participate. 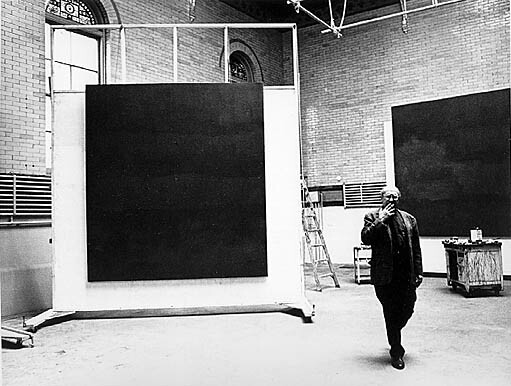 I did some breathing and then some listening and instead of hearing how irritated I was, or jackhammers, or all that narrative about Mark Rothko and Dominique Menil and modern art, I just heard the color black. For a long time. I am supposed to talk about the paintings by Mark Rothko, but I don’t think I can explain them. I don’t think that what I say or anyone says is the last word. I think the paintings themselves will tell us what to think of them – if we give the a chance. They will educate us to judge them. Every work of art establishes its own base for criticism. Every work of art creates the climate in which it can be understood. A picture lives by companionship, expanding and quickening in the eyes of the sensitive observer. It dies by the same token. It is therefore risky to send it out into the world. How often it must be impaired by the eyes of the unfeeling and the cruelty of the impotent. This attitude of receptivity, indispensible in art is also the attitude necessary for ecumenism – TO LISTEN. The experience of coming in annoyed, doing some practice and leaving a different person impresses me. Yoga isn’t fancy. A simple practice provides really effective ways to change gears and shift my perspective. I feel better, more connected, less agitated, when I practice. I had that and the gift of these words by Mrs. Menil. It served as a reminder to listen and to be a sensitive observer. I love this idea that every work of art creates the climate in which it can be understood. What if we approached everyone, everything with this attitude? These forty-five minutes of sitting, breathing, practicing and reading were such a gift. And on day two of the reunion, I had a blast. I love this, Amanda. I also think that it applies to writing. I needed to hear that since in the last few days I’ve been wondering if the stuff that I am putting out there has any relevance. “I love this idea that every work of art creates the climate in which it can be understood.” Thank you for your beautifully articulated insight. I pretty much only write for this blog, and I have some stats that tell me one person in Ireland clicked on my blog, 15 people from the US, etc, but it’s impossible to know what the real reach and the actual impact is. I operate under the basic premise that if it means something to me– if writing it was useful to me in some way then it has served an important purpose. Then, ‘isvarapranidhana’– relinquish the results and let the work do whatever it is out there to do. I happen to know that what you offer your readers on your blog and with your sequencing software is good. It’s really good, Olga. If you like doing it and it’s meaningful to you, keep it up. Your audience is reading and appreciating your work. I misses this, Olga. I’ve enjoyed every article I’ve read of yours! Hi Andre! I realized that I haven’t heard from you in a while and I really enjoyed our discussions! Did I loose you as a subscriber? When I moved to a self-hosted blog back in March I lost some of my WordPress subscribers through a technical glitch, were you of one of them? If so, sorry about that! Please come back: http://www.sequencewiz.org Hope to continue our conversations! I had a friend who wanted to be a painter – he wasn’t bad, either. He told me he gave the idea up the first time he saw Rothko’s work. I’m working with this idea: Each time anything comes into/out of being, reality changes. And something like this was my homily for yoga class last night… All of our actions – thoughts, words, deeds – follow from who we understand ourselves to be. As that understanding evolves, our actions evolve. Participating (I love that, Amanda) in great art is transformative. You leave a different person; you have a new reality. Another beautiful, insightful post, Amanda. Thank you. There are lots of lovely and wise quotes along the lines of, ‘the actions we take in small ways every day, over and over again, create who we are so that when the big stuff comes up, we can respond well’ (only whoever articulated this idea did it with more panache). It is similar to what you propose here, Bharat. We are re-creating ourselves (or reinforcing our personality and self) at each moment and with each choice we make. It’s a slow evolution– a slow transformation, usually. And it’s how we become a different person. love this: A simple practice provides really effective ways to change gears and shift my perspective. When I think of how people often seek to clear the mind, or the common belief that end result of meditation or Yoga is more of a blank state or emptiness, I think of how Chase stressed that the second sutra, which defines what Yoga, is the ability to concentrate or focus. When I expand that meaning into practice, it’s the ability to choose what to focus on. I work in mental health, “change gears” is a phrase I often use with the kids, because they so often remain stuck in their past or familiar patterns. When we can shift gears, we can become unaffected. This ‘unaffected’ quality is so so so useful. It’s a great thing to get a taste of as a kid and I love that you are taking to your group about this. I often wonder what my high school years would have felt like if I had practiced yoga then. For me, unaffected means that I don’t take things so personally. I have a sense that something other than my fragile ego is at the center of the universe. And when I feel that, it feels like I’ve got some space, I’m resourced, and I’m connected to something bigger which gives me a safe feeling. I can talk about it a lot, but it’s hard to explain, really. Of all the things I’ve tried, yoga (and Chase 🙂 ) has helped me to experience it and I’m so grateful!